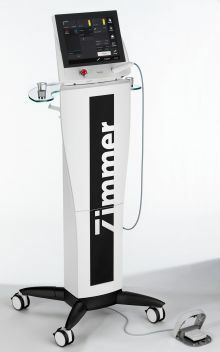 In the field of high-energy laser therapy, Zimmer MedizinSysteme is one of the pioneers on the market – the first high-power laser was already launched on the market in the 1990s. Since that time, we have been working continuously to further develop this form of therapy and the devices – together with experts from research and application. 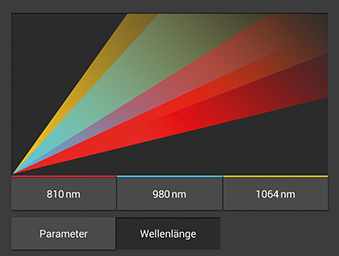 As a result, we set new standards again and again, whether in output and wavelength, in safety during use, or in simplicity of operation. With over 20 years of experience and more than 10,000 systems sold worldwide, Zimmer MedizinSysteme is one of today’s leading providers. Hospitals, physiotherapists and physicians throughout the world use our high-energy Opton lasers every day and rely on their therapeutic effect. Therapy with laser light is a widely used method in physical therapy. Laser therapy is a treatment with high-energy light which introduces large quantities of light into the tissue. As a result, healing is stimulated in a sustained manner. 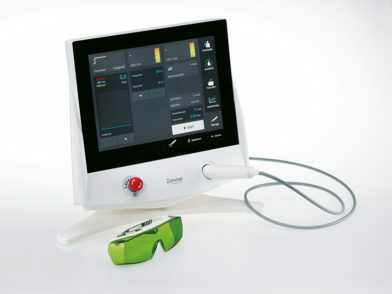 In particular, high-power laser therapy in which high intensities are used is becoming increasingly important. With laser therapy systems up to 25 W which are equipped with the most modern technology, Zimmer MedizinSysteme is setting new standards in the field of laser therapy. 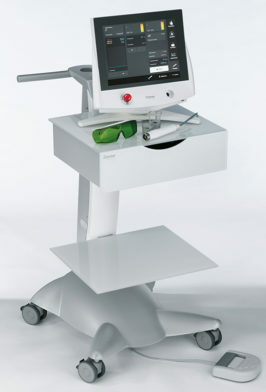 The laser light is output via an ergonomically shaped laser applicator which is equipped with an adjustable manual switch. By double-clicking once, the laser light is now emitted continuously, without any further action needed from the user. This ensures maximum convenience in handling for the user. 2 different spacers which can be quickly and easily exchanged hold the laser applicator at a defined distance from the skin. 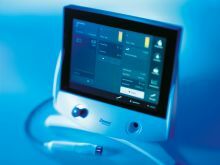 A temperature sensor integrated in the laser applicator enables the skin temperature to be monitored during the therapy. In particular, this provides more safety during application in the case of different skin types and helps avoid undesirably high skin temperatures. 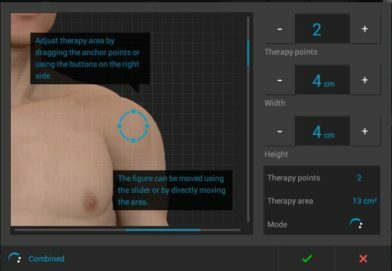 The screen allows quick, direct access to the therapy screen. 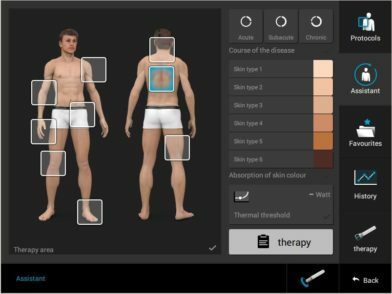 Different combinations of the treatment parameters allow the user to adapt the therapy individually to the patient and achieve the best possible treatment results. as well as deeper tissue structures are stimulated at the same time. of the radiation into the deep layers of tissue. in deeper layers as well. treatment area can be greatly enlarged. This can mean a significant time savings for the user. 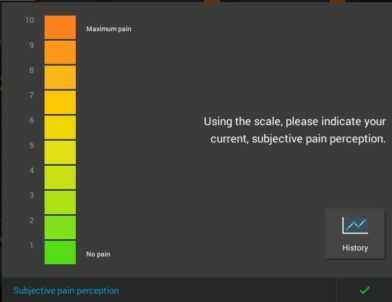 The integrated VAS provides information about the patient’s pain perception. 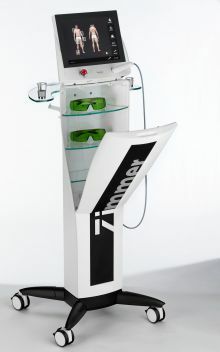 The large, colourful display and the ultramodern operation ensure enjoyment and motivation during use. 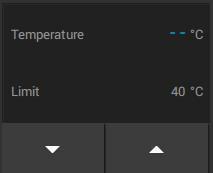 Recommended parameters are automatically saved. The amount of energy to be applied is recommended depending on the area to be treated, the pain condition and skin type.